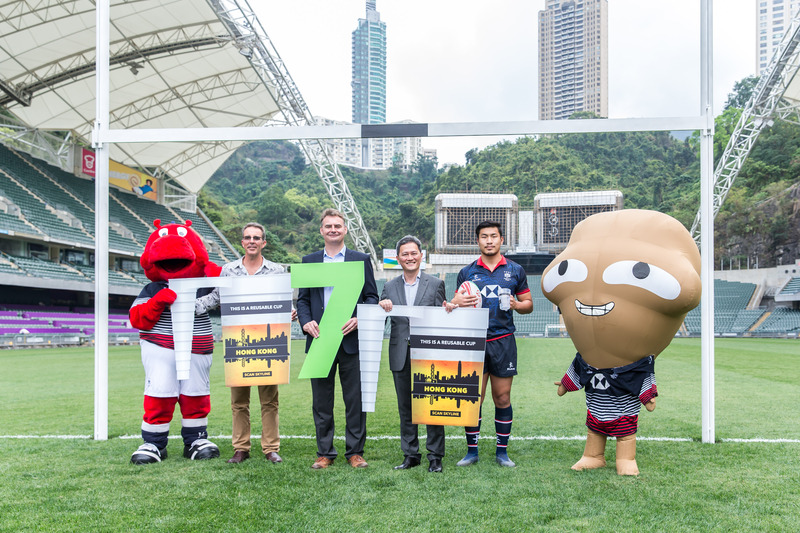 The Hong Kong Rugby Union (HKRU) has announced details of its sixth annual Green Sevens campaign, part of the Union’s ongoing mission to reduce the environmental impact of the Cathay Pacific/HSBC Hong Kong Sevens. The most visible element of the 2019 campaign is the introduction of a reusable, paid-deposit, pint cup. Inspired by the slogan, "Tackling Waste", the key stakeholders behind this year’s Green Sevens coalition include, for the first time, The Purpose Business, a Hong Kong­–based consultancy that helps Asian businesses be a force for good – for society, the environment and their bottom line. The HKSAR Government is also lending its support, represented by the Environment Bureau (ENB), Environmental Protection Department (EPD) and the Leisure and Cultural Services Department (LCSD); as are co–title sponsors Cathay Pacific and HSBC; and official suppliers Carlsberg Hong Kong, Swire Coca-Cola Hong Kong, and Holiday Inn Golden Mile Hong Kong. In 2019, The Purpose Business (TPB) is providing its expert consultancy to the campaign for the first time, supporting HKRU with advisory services, and monitoring and reporting on the campaign’s environmental performance. TPB’s primary role is to coordinate with the many stakeholders involved and assist in engaging volunteers and NGOs. “For passionate sport fans, it doesn’t get better than working again with HKRU and this iconic tournament to promote and inspire better understanding and adoption of sustainable and recyclable resources in our city. The Purpose Business is already an HKRU Community Foundation Sponsor and Partner and we couldn’t be prouder about growing our partnership with them as they champion the Green Sevens for the sixth time,” said The Purpose Business Founder and Director Pat Dwyer. Dr Merrin Pearse, affectionately known locally as ‘Dr Lahp-sahp’, or ‘Dr Garbage’ in Cantonese, heads the TPB Project Team. Merrin has been involved in prior TPB waste management campaigns with iconic Hong Kong brands and is co-facilitator of a community targeting elimination of single-use plastic. He has also lent his expertise – and happily rolled up his sleeves – to help recycling efforts at other major events including the Volvo Ocean Race and Clockenflap. He and the TPB team are set to take the same hands-on approach at the Sevens. 2019 is shaping up to be a milestone for the campaign, as the HKRU advances towards its goal of significantly reducing single-use plastic, one of the most pernicious waste drivers at large public events, through a new reusable cup scheme. 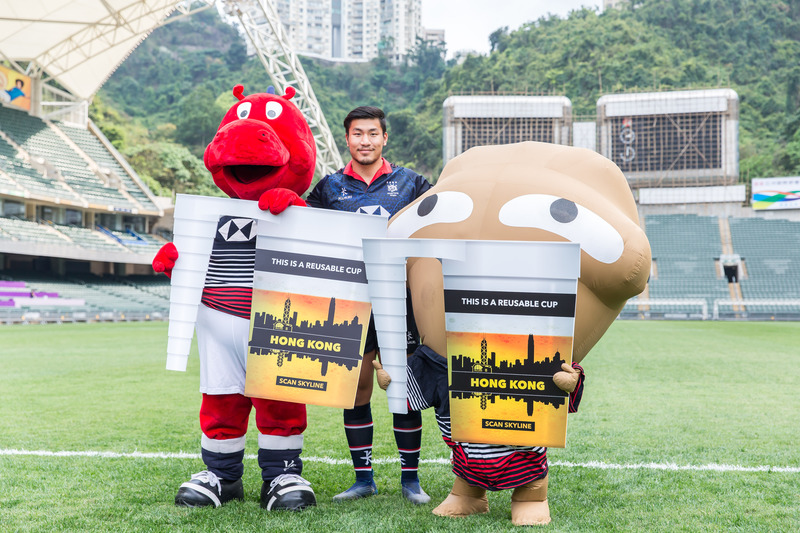 Spectators will be asked to pay a HK$10 deposit for a reusable cup, which on leaving they may return to reclaim their $10, or drop into one of the charity cup collection bins and have the deposit donated to Laureus Sport for Good Foundation, the official charity of the Cathay Pacific/HSBC Hong Kong Sevens. With the support of Green Sevens campaign partner Octopus Cards Limited, as an alternative to cash, cup deposits can be conveniently paid and refunds received using your Octopus card – make sure you top up before you turn up! The HKRU has made a significant investment for the 2019 Sevens in the purchase of 250,000 reusable cups, which are made from fully recycled plastic and have a lifespan of five years. These will be collected, washed and sanitised, and re-used over the event weekend. The HKRU is examining ways to use the cups at the numerous other events and international competitions it hosts each year, and will partner with local social purpose organisation BottLess to make them available for non-rugby events as well. HKRU CEO Robbie McRobbie said, “We’re proud to be introducing reusable cups as part of our continuous efforts to make the Sevens greener, and we believe that this will significantly reduce the amount of plastic waste generated, eliminating potential harm to the environment and helping to save space in our increasingly full landfills. “We would especially like to thank Carlsberg, Coca-Cola and Holiday Inn for their support through the years, and for assisting in implementing this new measure for 2019. Without their support this would not have been possible. At recent editions of the Hong Kong Sevens, the public has responded well to a similar initiative, re-using plastic jugs, with spectators receiving a HK$10 discount upon refilling their jug. In keeping with stadium and event policies, reusable jugs and cups will not be used in the South Stand, but the system will be implemented across all other public concession points. Since its inception, the “Green Sevens” campaign has earned significant recognition for its efforts and results, including certification under the Hong Kong Government’s Green Outdoor Event Scheme and taking the Green Event Pledge. 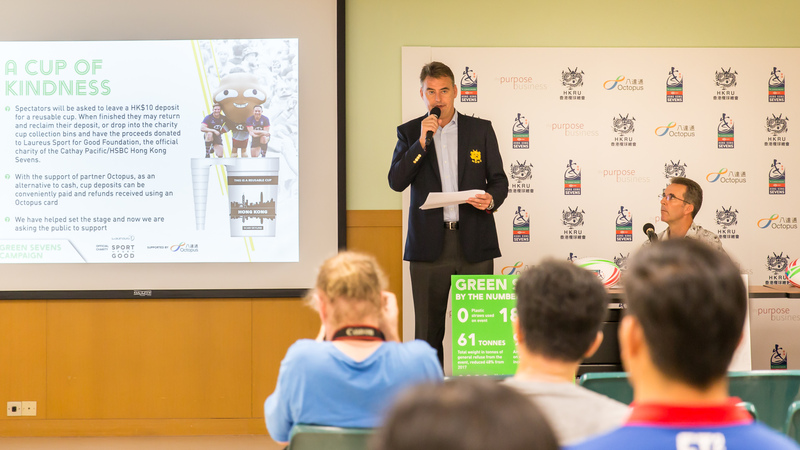 In addition, the entire Sevens recently became the first, and presently only, Hong Kong sporting event to be recognised by the Green Outdoor Event Scheme, which is conducted by the Hong Kong Productivity Council. Furthermore, in an exciting step that demonstrates its commitment on a world stage, in the last few weeks the Hong Kong Rugby Union has joined as an official signatory to the UN Sports for Action Climate Declaration, the first rugby union to do so.